Paddy Power offer racing fans the most complete horse race betting app. Besides boasting a top class tipping, racing form and results section, you can also watch replays of horse races at no extra charge. Mirror Racing will work on any iPhone, Android, BlackBerry or Windows Phone. Get a full list of the days horse races from the United Kingdom and Ireland. Tipster and Mirror Racing Predictor sections offers reliable betting tips. Mover tabs shows which horses are moving up or down in the betting markets. Full access to both the Racing Mirrors news and twitter feeds for regular updates. Mirror Racing is actually a web app, but it works in exactly the same was a normal app would. 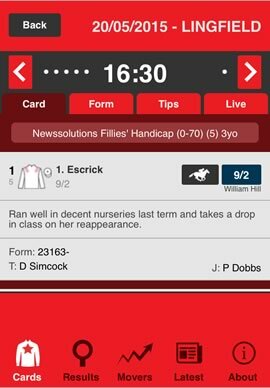 What you’re getting is the Daily Mirrors horse racing app, offering you information on upcoming races along with a comprehensive tipster service. The app has been in circulation for some time now, so it’s fairly established and coming from one of the bigger news corporations in the UK, you’d expect it have something about it. The app sets off with a list of the entire racing schedule for that day from the UK and Ireland. The list will include the time and name of each race, including the handicap and age of the horses that are competing. It’s a pretty basic overview in all honesty, but it’s when you click on the race for more information where the app really comes alive. Once you’ve selected your race you then get a look at all the runners and riders for that race. You get to see the silks for the jockey, name of the horse, brief form and also a little synopsis of how it ran in its previous race. They’ve also recently updated the app to include the latest betting price as taken from William Hill, which is a nice touch. You are able to click on each horse to find out more about their recent form. It tells you the date, course, distance it won/lost by, weight and the position it finished. Whilst all pretty brief information, it’s definitely enough to form an opinion on how it may run. This section also includes the ‘Mirror Verdict” which is a sentence or two with how it should fair in the race, given the track its running at and it’s opposition. Back into the race card and the top section lets you select the form tab to get a break down of each horses form leading up to this race. Same layout as previously mentioned and should be able to highlight who may be fancied for this race. The Tips section found in the top nav bar shows the Mirror Racing Predictor, along with a more detailed Verdict and Tipster section. These are actually all really nice features and come from some reliable sources within the industry. The bottom nav bar includes a Results section where you can get the results for any days racing within the past 5 days. It shows you the results from each race including the top three places, but you can click on each to find out a more detailed look at the full results and placements. The Movers tab, also in the bottom nav bar, is a really interesting feature. It shows you which horses are ‘Steaming’ and which horses are ‘Drifting’ in the betting market. We can’t think of too many other apps that include this, so it’s a really good feature in our opinion. We had high hopes coming into this app review and we weren’t let down by the Mirror Racing app. The inclusion of tipster services and also the depth in which it showed horse data was quite refreshing. The mover’s section is a neat touch and the only thing that really lets down the app is that it’s still a web app. 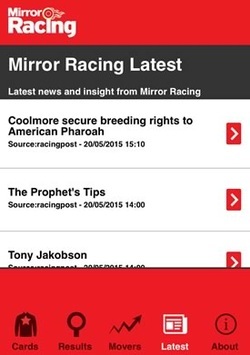 On the whole, if you are looking for an ‘all in one’ type of app, then the Mirror Racing app is definitely one to try out.